Home » Library News » The Library’s Fall Events Calendar is Here! The Library’s Fall Events Calendar is Here! 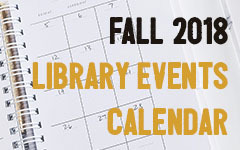 Get out your calendars, because the Library’s schedule of fall events has arrived! We are delighted to offer a diverse array of events this fall, read more and RSVP below.